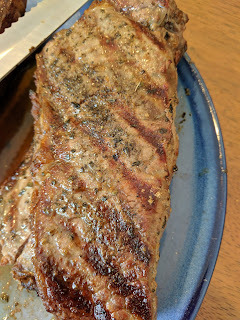 I feel like the steak grilling community sleeps on shell steaks but they are delicious and flavorful. They cook up in a few minutes and come out great. More people should grill with shell steaks. I was not expecting to grill today so I just threw together some things that I had around the house. Normally I like to make a nice marinade and let the steaks baste overnight but these came straight from the fridge to the grill touched only by a few things I had lying around. Still came out great though. We want direct heat on half of the grill and indirect heat on the other half. For my three burner grill this means turning two burners up about three-quarters and leaving the third one off. We're only going to cook on the direct heat side which I read somewhere is good for convection which improves the blah blah blah of whatevers. I dunno. It helps the tastees stay in the meat. Also useful if you're going to cook something that wants indirect heat on the other side like chicken legs. The real step one is to douse the steaks in olive oil. This adds moisture which is important and will also help our other ingredients stick to the steaks. Many marinades I use have an olive oil base, and adding olive oil directly to the steaks when you have little time seems to help a lot. In addition, the olive oil will cause the grill to flame up when you toss the steaks on. That will allow for some nice grill lines and extra flavor. However, it is important to quickly move the steaks after the grill flames up so that the steak doesn't get burned. I leave the steaks on the flame for a few seconds and then move them to the indirect heat. After 15 seconds or so the flame should die down and we can put the steaks back on the direct heat. After adding olive oil I gave a liberal pour of that thick kosher salt. It's yummy. Then I added a less liberal amount of black pepper. Fresh would have been better but I used the big canister you get from the super market and it was fine. For a soy sauce based marinade I like to add some ginger which I think improves the gingerness of nearly everything. In this case I didn't have any soy sauce but adding ginger was easy (because it was around) and helped to round out the taste. You gotta rub the ginger in though or it won't really take. I was running out of time but I felt like it needed a little more something. I'm a big fan of basil but a big leaf on a steak feels offensive to me. Luckily we had some crushed basil in the pantry and I dumped gently coated the steaks in the spice. The olive oil helped it stick which was key. 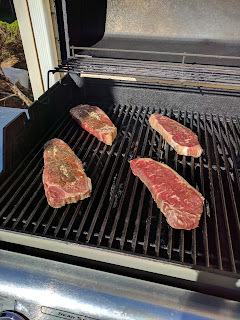 Once the grill was heated it was time to throw on the steaks. I was careful because of the flames (see #4) and then let the steaks grill on the first side for about five minutes. When one side was done I flipped them over, re-added some of the seasoning on the other side and then let them cook for another five minutes. Every site says you're not supposed to dig in right away because you need to let the fibers of the meat fibernate or something after they come off the grill. In my case the kids wouldn't come inside and wash their hands so it took about 10 minutes before we could start. As everyone stuffs their face they're sure to say: "Can I get up now?" or "Why can't I get up now?" but what they really mean is: "I love you, daddy! Thank you for making the greatest meal I've ever had!"